The long awaited seasonal NONILAND chocolate has finally arrived! The is a straight dark chocolate bar with 78% Noniland cacao content and sweetened with maple. 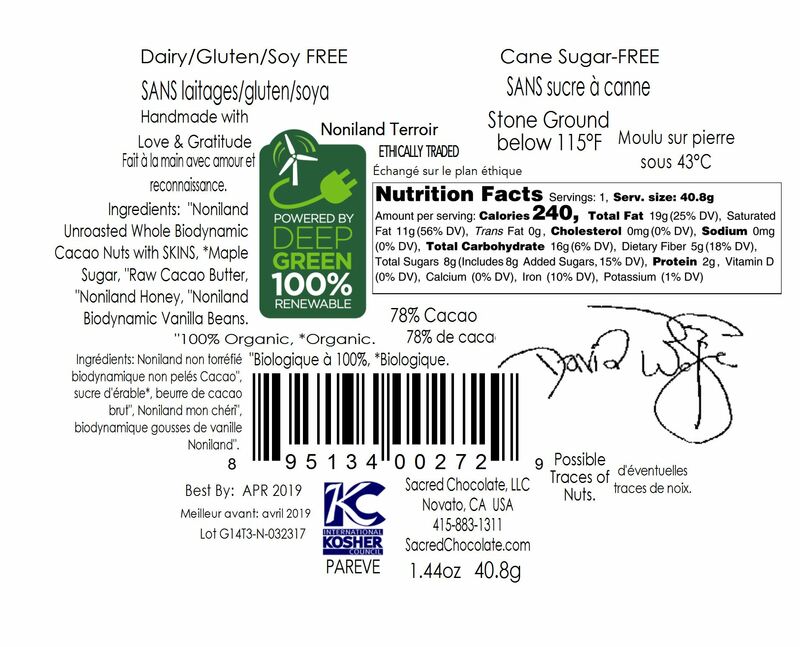 Hawaii estate grown, the cacao trees are grown by David Wolfe on his farm in Kauai have received the ULTIMATE LOVE and CARE! The vanilla in this chocolate is growing in the cacao trees and the honey is from the same farm. This chocolate has light candy notes that are truly unique. Please note there is 0% Noni fruit in this bar. This EXTREMELY rare and limited chocolate comes as a 1.44 ounce bar poured into our famous Golden Spiral Heart shape. I was in Amsterdam in 2003 talking to an owner of a cafe one morning. Offhandedly, the owner said to me, "One day I'm going to buy a cacao farm and retire." Until that very moment, I had never even considered starting a cacao farm. The idea of growing cacao trees had never crossed my mind. All of a sudden it all made sense. From that day forward I started thinking about growing the best cacao ever. In 2006, this led to the founding of "NoniLand: Organic Cacao Farm & Bee Sanctuary." Most of the cacao trees at NoniLand were grown from fresh cacao beans to fruiting trees. Many have vanilla or other types of orchids growing in them. From permaculture to biodynamic to compost teas, we've tried every alternative farming strategy. They have all been wonderfully enjoyable. Now NoniLand organic cacao beans are being stone-ground into Sacred Chocolate bars! You will taste floral notes, unique finishes, new vistas of sensation, and rich vanilla tones in each bar. We believe we have achieved something very special. 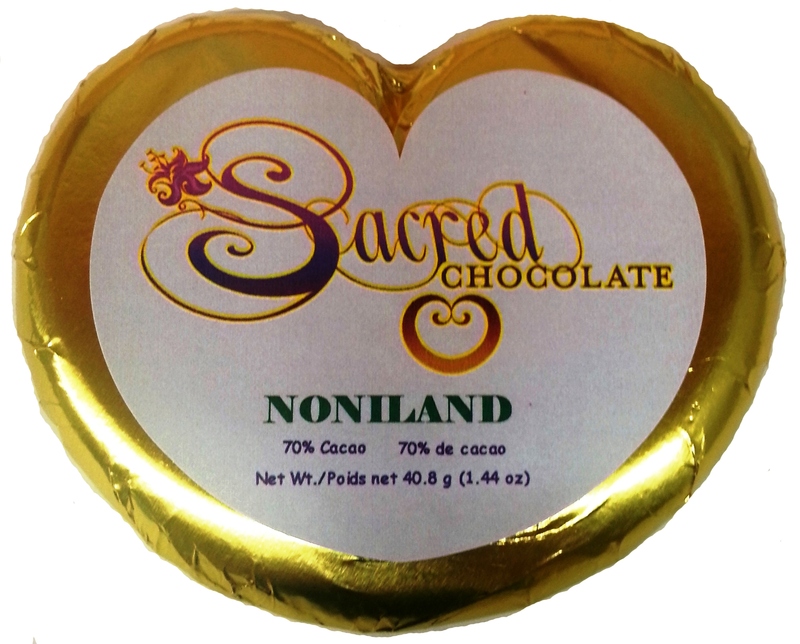 Enjoy NoniLand Sacred Chocolate! Sacred Chocolate is slowly stone-ground from bean to bar right in our custom chocolate factory in Marin County, California, which was designed from the ground up to make raw chocolate! Each 1.44oz bar comes in the shape of a perfect golden spiral heart, symbolic of the fact that raw cacao is so good for the heart. This delicious Sacred Heart chocolate bar is hand poured & hand wrapped. All Sacred Chocolate is prayed over by Sacred Steven, the Sacred Chocolate Oompa Loompas and others! "Noniland Biodynamic Unroasted Whole Cacao Beans with SKINS, *Maple Sugar, "Raw Cacao Butter, ~Noniland Honey, "Noniland Biodynamic Vanilla Bean. Produced in a Facility that also Processes Nuts. Contains Honey. Stone Ground, Long Conche, below 115 Degrees Fahrenheit. Cacao Souce: Noniland, Kauai, Hawaii. Cacao Butter Source: Heirloom Arriba Nacional, Ecuador.